On tonights action packed episode we had “Viewer Mail” first and moved swiftly on to the first guest… “Kayin” the self prclaimed “Spit bucket boy” from Headhunters partial conversion team. They are going to be releasing v3.0 with lots of new bells and whistles. You have heard the praises of BLUE and JUDGECAL about the coolest new reason to continue playing our favorite game…Zerstörer – Testament of the Destroyer YOU MUST GET THIS!!! It is actually fun to play single player Quake again! 5 new weapons, cinimatic cut scenes, and more. We had 2 of the team Zerstörer on tonight. One was the one and only Darin from Quake will rule the cosmos and the other was Dave Weiden. These boys have done an exceptional job and our hats are off to them. Next up was a gentleman whom calls himself “hyPer” and he runs a web site called In The Pit Rocket Arena Strategy dedicated to…you guessed it…Rocket Arena. Mace Royer was live in the studio tonight. GIRLBOMB is still out sick and the “chatbitch” loonyboi sat in her stead. Host: JUDGECAL (a.k.a. 23SKIDOO) — Pseudo’s very own Dark Knight. A champion and marauder, Judgecal divides his time between combing the farthest reaches of the internet and hacking wide-eyed unsuspecting Quakers to ribbons. Tremble when he approaches, fear him when yer near him. Co-Host: BLUE ala “All the carnage that’s fit to post!” The man whom single handedly created an industry from scuttle-but and news tid bits into the Empire that is BluesNews. Way back from the beginning of Blue’s Quake Rag, Blue has diligently reported and updated (sometimes moment by moment) all the breaking news in the “Quake Community”. An invaluable source of information now live and in person. Legendary sports reporter Mace Royer brings you all the Quake action with his reports on Quake Phenomenon, Quick Quake Tips of the Week, and live interviews with all the special people in the world of Quake, including the Promoters Corner, with the almighty, top-of-the-line, most revered, high-end Eddie Jones. Chat Boy Loonyboi gives IRC updates from the live chat audience. Be sure and join us on irc.pseudo.com during the show and he will field your questions! The whole crew on Quake Cast gives you the best and baddest news, interviews and reviews. Sources: Quaddicted archived this show on mp3. Excellent photos by Wendigo, hosted by QuakeWiki. 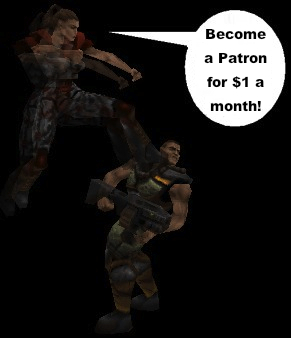 Thank you to all for preserving this small treasure of Quake history.